George Nelson, one of the very great designers of post-war American modernism, had a decisive influence on the term mid-century design. While living in Rome for a while, he became familiar with Classical Modernism, which has always influenced his work ever since. From the 1940s onwards, he worked in his own design studio and designed the Nelson Bench, which is now produced by Vitra. Nelson's interest in architectural forms and techniques becomes very clear at the Nelson Bench. In context of his role as creative director of the American furniture manufacturer Herman Miller, Nelson maintained close contact with other design greats of the 20th century, such as Alexander Girard or Charles and Ray Eames, designers whose designs for Europe are also produced today by Vitra. Nelson's Vitra Coconut Chair, which is clearly reminiscent of a section of a coconut, consists of a base made of chrome-plated tubular steel and a padded seat shell; more colourful is Nelson's Marshmallow Sofa, which goes much more in the direction of Pop Art Design and reinterpreted the furniture genre of that time. 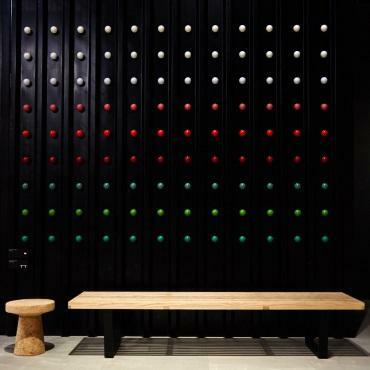 Consisting of a steel structure the sofa features 18 round, colourful cushions, which help give the work its name. Another piece of furniture that highlights the diversity of Nelson's designs is his Home Desk, which he designed in 1958 and that in a very reduced way, yet with its colourful plastic partitions and sleek legs, it still sets the tone for living and working environments. A central component of the Vitra Nelson Collection is the countless clock design that the designer created during the course of the 20th century. The Nelson Clocks are as diverse as their uses, and sometimes a bit more extravagant. The Sunburst Clock designed in 1949, for example, is reminiscent of the sun's rays, is available in various colours and adds an elegant note to any space- whether in colourful, red, walnut or in a particularly elegant black design as part of the Black Collection. 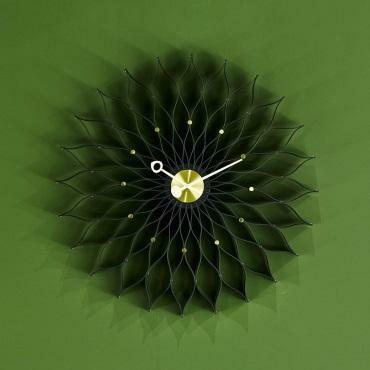 ´Further popular variants include the Vitra Sunflower Clock from 1958, which, as the name suggests, is reminiscent of a blooming sunflower blossom, is delivered in addition to their classic version in a black version. Essentially a practical commodity, the sculptural wall clock is actually more reminiscent of a work of art than a clock, combining functionality with unusual aesthetics. The various Nelson Wall Clocks are also joined by his Desk Clocks, designed between 1947 and 1953, which are versatile and eye-catchers for any bedside or desk. Whether the Tripod Clock, Night Clock, Diamond Clock or Cone Clock - the Vitra Desk Clocks should have something for every taste. In addition, there are three clock especially for children: The Zoo Timers Fernando the Fish, Omar the Owl and Elihu the Elephant, three colourful comrades from the animal kingdom, enliven any nursery on and complete the unique variety of the Nelson Collection.